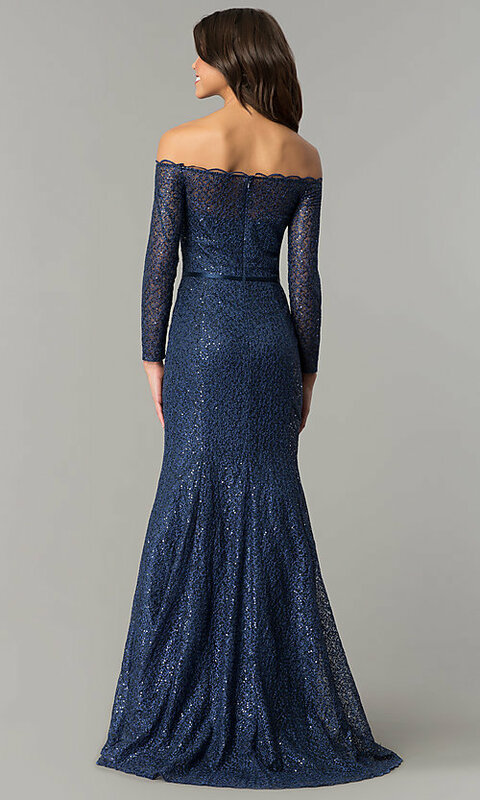 This off-the-shoulder navy blue prom dress by Dave and Johnny is ready to wow at your next formal event. Available in junior sizes, the long designer dress has a sweetheart lining that shines through the sparkling mesh overlay. Beaded lace shimmers on the lovely blue formal evening dress from the scalloped neckline to the hem. Off-the-shoulder long sleeves provide a sultry detail, as well as additional coverage, for a romantic look. Defining the natural waistline, a gleaming satin band tops the hip-skimming skirt that flares out from the knees before flowing to a floor-sweeping length. Under $200, this off-the-shoulder navy blue prom dress is sure to make a dazzling impression on your fantasy-filled evening.